The Juniper Sea Green, 'Juniperus x pfitzeriana 'Sea Green', also known as Chinese Juniper, is an evergreen Juniper that makes a great hedge that provides winter interest. 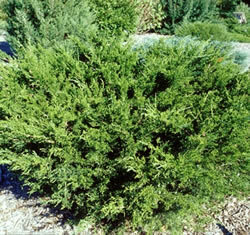 This Juniper is a compact shrub with a fountain-like, arching habit. The bright green, fine textured foliage forms a vase shaped six foot plant. The Sea Green is tolerant of many soils and weather conditions. Place this plant in well drained soil. Sea Green Junipers are used for accent plants, borders, windbreaks and screens.